a breath of fresh air, in an ageing franchise that needed somewhere new to go. 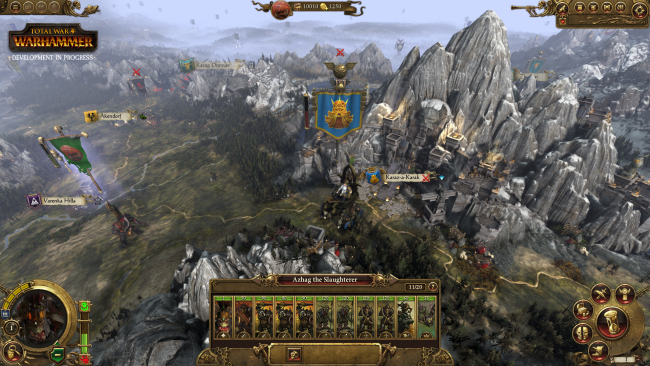 First off, I was going to make a Video review for this game but, having loaded Total War: Warhammer onto my computer I quickly realised that what use to play games on ultra, can now only deal with medium graphics; at a push. And so, with my shame and with no pretty graphics to show off, I decided upon the oldskool way of reviewing… typey typey. For nearly 16 years now the Total War franchise has dominated historical Wargaming, bringing it from quite an obscure subgenre to the relatively main stream, refining as it went along but not deviating too much; until now that is. With a complete Volt-face Creative Assembly have thrown aside its safe zone, got into bed with the biggest table top Gaming Company in the world, Games Workshop, and launched a Fantasy game… and all the History Nerds did rage; or did they? It was a brave move for CA to take a leap into fantasy gaming, and risk alienating their fan base, but to me I think it was the natural progression. Granted phalanxes and Roman legions aren’t really anywhere near undead armies and magic but I mean, they were running out of eras to move to, without having to completely reinvent their fighting mechanics (something I think they should do to be honest but that is a point for another time) and so instead of making a Shogun 3, or Empire 2, they took a gamble that History Geeks and Warhammer Geeks have a lot in common made a decisive change and it paid off; nearly 500,000 copies sold in the first few days of sales. Their movement to Fantasy let them throw off the proverbial shackles of Historic War gaming and opened up not only combat but also how the units interact on the Campaign map. It is, in short, a breath of fresh air, in an aging franchise that needed somewhere new to go. For those of you unsure still if you will enjoy the change in proverbial scenery, then let me reassure you that, despite the façade of massive change, the core mechanics and style of play are still pretty similar; including most battle commands and campaign map. They have just taken a few things out and added a few additional bells and whistles. 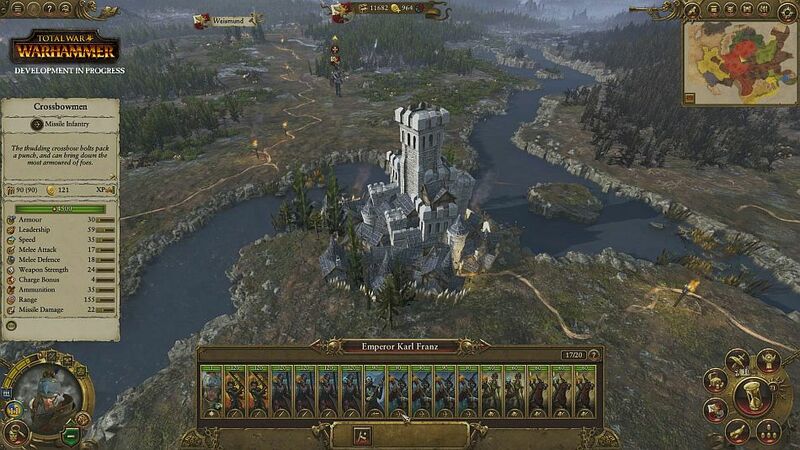 There are numerous factions in the game with current playable ones being (depending if you have the chaos expansion or not) Empire, Dwarves, Orks, Vampire Counts, and of course Chaos; Bretonians can be unlocked) . All with their differing play style, abilities and victory conditions. Dwarves and Humans are more like traditional TW factions, well apart from the magic and the huge flying griffins and gyro copters, but Orks, Vampire Counts and Chaos are, pun intended, completely different beasts, with Orks needing to fight, or be consumed by it within their own ranks, and Vampire counts having to spread their specific corruption before moving into new lands; or risk losing units pre fight. Heroes and lords, which now replace agents, get skill trees that can be upgraded and tweaked to turn them into one man army bashers and, in a lot of cases, someone who, if present, can turn the tide of battle. Gone are the days when your Commander is surround by a retinue, no, he’s a single unit on his own, though I did find myself attaching them to units using the grouping keys, just for extra protection and ease of play. As well as being Super units, the Heroes also get given Quests as the game goes on and although quite entertaining, giving you hero a story line (something the historic games never did) it started to be a bit, well tiresome, and unattainable as time went on. Asking me to attack areas and armies deep in enemy territory, something I couldn’t afford to do, with chaos at my door; or as was the case in a few occasions, in my front room rampaging for biscuits. City management is similar to Rome 2, a more streamlined version from the older games, and helps speed up the campaign game play a bit without over complicating things. This being said I did find it slightly annoying that your upgrades had no impact on the design of the city, it just stayed as it was. Personally I liked the old days where villages turned into towns and towns turned into cities and cities turned into mega cities but I guess they had to cut some things out. And why they did that? Well to give you one of the most spectacular looking Campaign maps yet and due to the nature of the proverbial beast, you have some extremely diverse and pretty awe inspiring areas. Ranging from Vast snow cap mountains and fiery volcanoes to rolling hills, forests and Barren, corrupted plains. An added bonus is when spreading your corruption with the Vampire Counts it actually affects the look of the map, which was a nice touch and of course, wafting through all of these diverse vistas you have the winds of Magic, which actually affects the amount of magic you get in your battles. One thing to say, on a side note is, regular weather doesn’t seem to have a huge part to play in the game and is more geographical than seasonal, as it used to be. In its place you can now gamble on the winds of Magic, so in an old game where you would wait to see if it would stop raining, in TW:WH you gamble to see if you will get more or less magical wind; just like the weather it can have a dramatic effect on how you fight your battle, and in some cases can be the difference between winning and losing. The use of Magic in general is a big change for this franchise and I think they have dealt with it well. Instead of having units that can just spit out magical fire spells all they want, decimating entire armies, you have different types of wizards who can tap into the winds and for a cost can cast varying strengths of spells. The Thing to note though, is that once the winds are gone, and you have used up all your allocation, that’s it, no more magic. Apart from the latter and the fact that you have Hero and flying units now (which is pretty bitching) the baseline mechanics of battles is the same… bar one thing, and this makes me very happy: they brought back reinforcements! I’ve always made it clear that the unit cap of 20, restricts the game somewhat, especially in the historic battles, where you can’t really have an EPIC fight, because you just don’t have enough units. In TWWH though, this has been partially remedied with the reintroduction of Reinforcements, giving you a chance to field up to 40 units; something that has been extended to skirmishes and multiplayer, where you can now fight larger armies…BOOM!! My final comment on battles, and something that really made me nod my head in acceptance, was the use of timers,for one side, depending on if you are attacking or defending. If you are attacking you have a time limit to destroy your enemy in and if you don’t, they win. This stops armies from just camping and waiting for the enemy to hit them. Something I realised quickly when I attacked some orks, found I was near a hill, stood on it and the Orks just looked at me as the time ran down; I soon moved! All in all, I’ve really enjoyed my time playing Totalwar: Warhammer and it has been a breath of magic winded air, in an increasingly stale franchise. Don’t get me wrong there are a few additional niggles, like Formation movement, some stupid and overly aggressive AI and the lack of navel combat but as it is, I would say, and this is pretty hard for me to admit being a history geek, ione of the best titles they have created and something they can defiantly build upon. I just hope they don’t give up on the Historic side of things and start to innovate a bit more when it comes to mechanic and formations; you’ve made this step CA, why not go all the way through the looking glass.